Disclosure: I received this box for a Wantable review, but all opinions expressed are my own. This post contains affiliate links. See our complete disclosure policy here. One of the most exciting things about receiving jewelry as a gift is finding out what’s in the box. When you get the gift, you can pretty much figure out that it’s jewelry by the size of the box and sometimes by the name ON the box, but there is still that curiosity of what it will actually be. Reader Giveaway: One lucky Jinxy Beauty reader will win the Crimson Necklace and earrings, Emerald Sun Earrings and Floral Tassel Earring from Wantable (ARV $60). To enter, just complete the entry form below by 11:59pm ET on 7/6/13. Good luck! 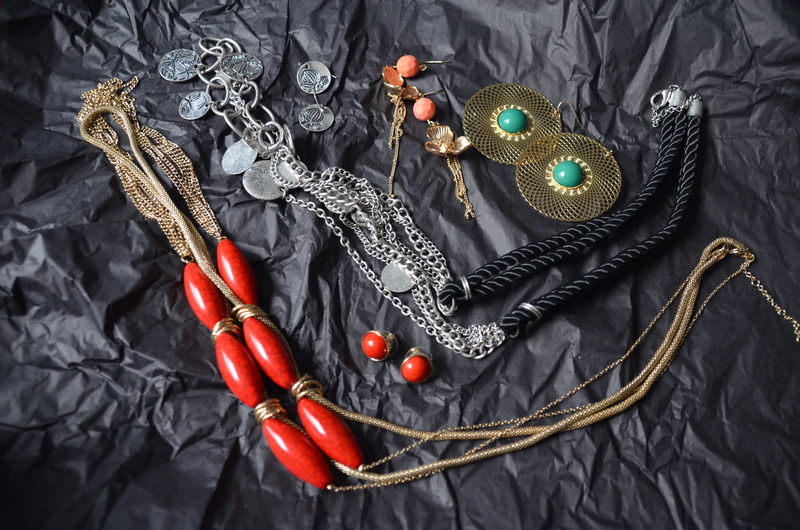 This entry was posted in Accessorie, Giveaway, Jewelry, Review, Uncategorized on June 13, 2013 by Chrysa. I learned: Discover a new you. Each box is packed with unique and on-trend pieces hand-picked by our stylists just for you. Oooo! I LOVE that black and silver necklace you received. How totally unique! What fun! Thanks for the links and your thoughts on Wantable! I think I need to go order a box now. I learned you can make a one-time purchase for $40, or subscribe for $36! All personalized!